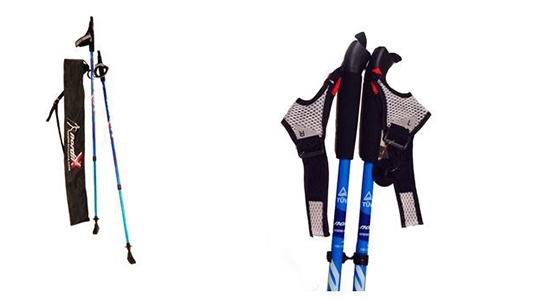 Budget Friendly Nordic Walking Poles With Professional Training Video/ DVD, and Water Bottle Holder. 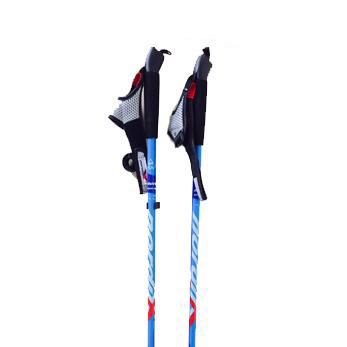 The Great Value Nordic Walking Poles is an adjustable pole made of Light Aluminum. Grip: Comfortable EVA sweat absorbing coating. Hand Loops: Ergonomically shaped for right and left hand; soft no rub material. Adjustable. Blunt Carbide tip for soft surface. *Listed shipping prices apply for the U.S. only! When you have selected the right equipment, it is important you learn how to properly use it! Many people look at a pamphlet or a website and assume all they need to do is walk while holding the poles. Unfortunately, they fail to pay close attention to technique and never receive the benefits Nordic Walking truly offers. While the process for learning Nordic Walking is not complicated, like any sport there are essential foundations one must learn. Clearly, the best way to learn Nordic Walking is via professional instruction. Nordic Walking is a relatively new sport in North America and since this type of instruction may not yet be available near you, the best solution is our Nordic Walking Instructional DVD/Video. This highly acclaimed resource allows you to learn visually, in the comfort of your home. If you are already receiving professional instruction the DVD/Video will allow you to continue learning at home, and fully support your training experience. There is no doubt you’ll quickly realize (and feel) the difference proper technique makes - as you understand what Nordic Walking is really all about! By the way, the Nordic Walking DVD/Video is not a quick infomercial for the sport. This sixty minutes full-length, instructional DVD/Video is produced by Bernd Zimmermann the founder and president of the American Nordic Walking Association, and provides a complete picture of Nordic Walking explaining the following key areas in detail: Nordic Walking History, Advantages of Nordic Walking, Basic Techniques, Advanced Techniques,Typical Mistakes, Personal Heart Rate Zones, Interval Training, Health Benefits of Nordic Walking, Fun and Exercises with poles, and much more.